Industrialised countries will cut funding for the Global Environment Facility (GEF) from USD 4.4 billion in 2014 to USD 4.1 billion for the four year budget from 2018. The main reason is that the US government has pledged to slash its contribution by almost half, from USD 546.25 million it paid in 2014 to USD 273.2 million. This is a serious setback because GEF has been one of the world’s major sources of green funding for developing countries. It has given USD 17.9 billion to support a whole range of projects that combat climate change, restore degraded farmlands, protect biodiversity, clean up toxic chemicals, reduce the amount of poisonous mercury in the environment, tackle wildlife trafficking and so on. Its small grants programme has helped farmers in various developing countries adapt to climate change impacts, especially water shortages. Other countries have stepped up to fill the funding hole created by the US under President Donald Trump, but they have failed to do it all. Canada announced here that it will contribute USD 171.64, a major increase. The announcement came too late to be included in the current edition of the GEF report (see table below). Germany, Japan, Britain and France are among other developed countries that have increased their contributions. Large developing countries have also stepped up to the plate, China increasing its pledge to USD 22 million, India to USD 15 million, South Africa to USD 6.87 million and Brazil to USD 6 million. One effect of the budget cut is that the GEF has decided that now even the poorest countries have to mobilise five times a GEF grant in co-financing before a project is approved. That means that for every dollar potentially available through a GEF grant, the government of a recipient country has to show that it can get five dollars from other sources. 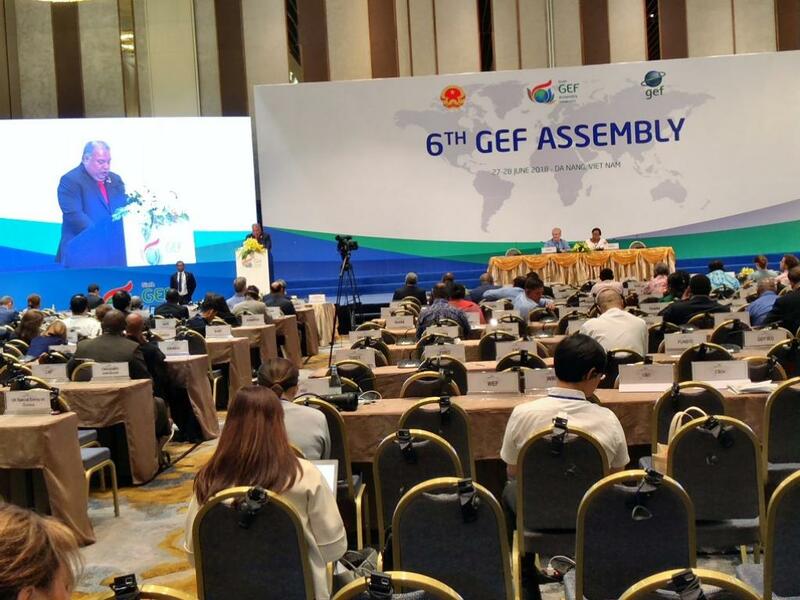 As the President of Kiribati pointed out at the GEF assembly plenary, Least Developed Countries (LDC) will find it very difficult to mobilise this level of co-financing. For larger developing countries such as China, India, Brazil or South Africa, the co-financing requirement is nine times the original grant. A senior official in the Indian government’s Ministry of Environment, Forests and Climate Change told thethirdpole.net that the ministry officials are used to this and no longer find it difficult. Bureaucrats and diplomats from India, China and Chile told thethirdpole.net that they saw this as yet another attempt by the Trump administration and a few other industrial country governments to refuse to abide by their responsibilities for the harm they have caused to the world. “We cannot allow the US government to renege on its responsibilities just because President Trump refuses to acknowledge them,” a Chilean diplomat said.